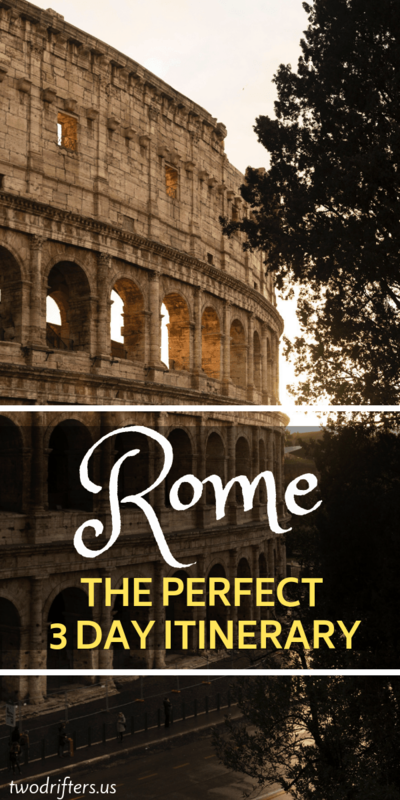 In this guest post, Andrea of One Savvy Wanderer shares an awesome itinerary for 3 days in Rome, Italy. Between the long list of must-see spots like the Colosseum, the Vatican, and the Pantheon and the amazing food and wine, there’s a ton to do (and eat and drink!) in Rome. Fortunately for those on a time-crunch, Rome can be experienced in as little as three days—but only if you know where to begin and how to draft the perfect itinerary. 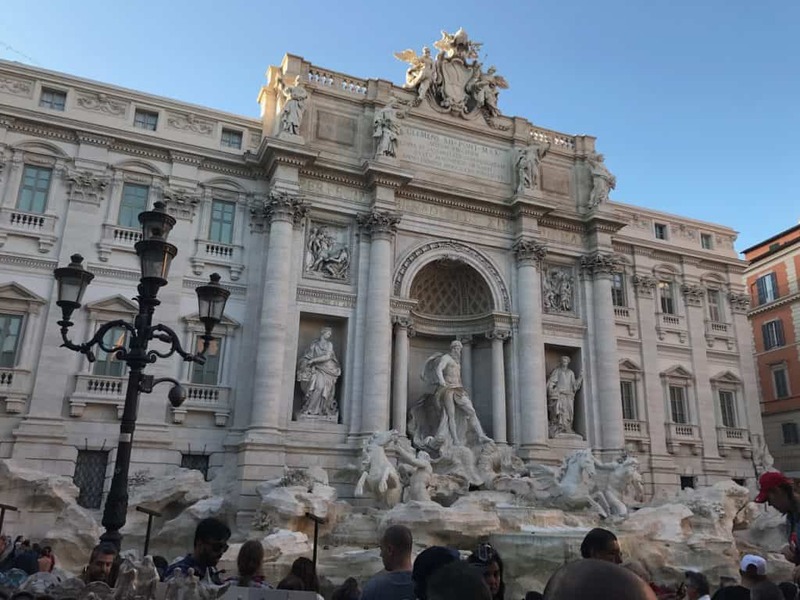 I studied abroad in Rome during college and have returned two times since, so I mined my experience to put together this three-day Rome itinerary for you on your upcoming trip to Rome. 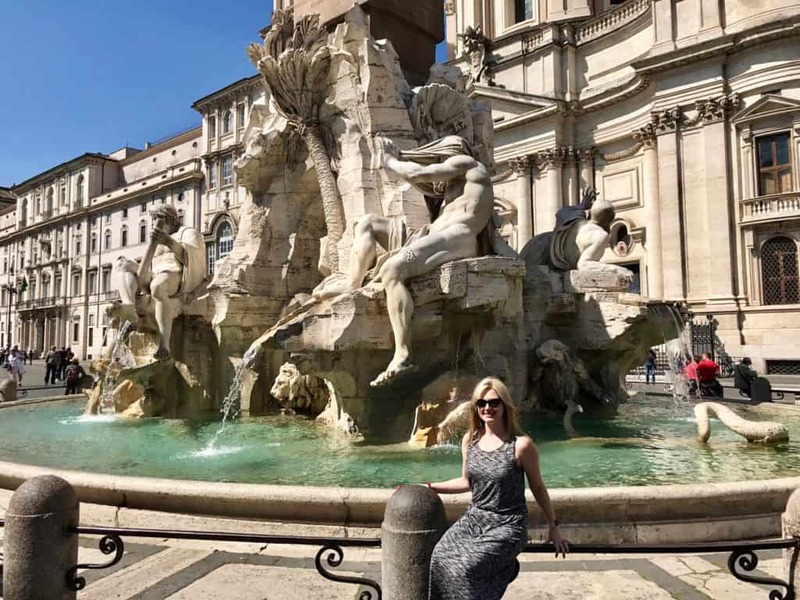 For budget-friendly tips on how to navigate the two airports in Rome and recommendations on where to stay during your trip, check out my Rome Travel Guide for the Savvy Traveler. 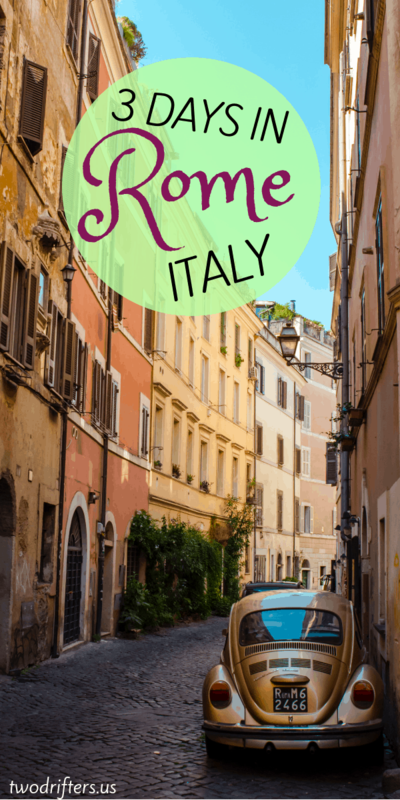 And when it comes time to pack for your trip to Rome, be sure to reference my post on The Savviest Items to Pack for a Trip Abroad, which includes a printable packing list! Welcome to Rome! It’s going to be a long day (first of three!) 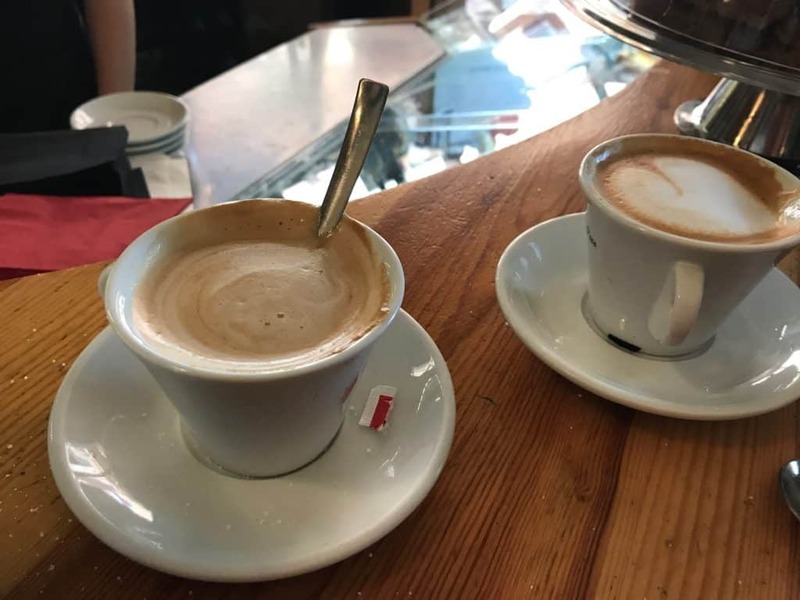 with lots of walking, so be sure to get started by stopping at a nearby café for a cappuccino and cornetto (croissant). The cafes that cater to locals only charge about 1€ for a cappuccino to drink at the bar (coffee “to go” is not a thing in Italy) and usually charge a bit more if you sit at a table to drink the cappuccino. After enjoying your cappuccino and cornetto (which should also cost you about 1€), it’s time to begin a free self-guided walking tour of some of the main sights in the city! Want to see the sites even faster? Consider taking a tour with Big Bus Tours. Piazza Navona is one of the most popular squares in Rome and its central location relative to other tourist sites make this a great location to start your day. There are three fountains in the piazza, including the well-known la Fontana dei Quattro Fiumi, along with numerous street entertainers like artists and musicians. From Piazza Novona, take a quick walk through the cobblestone streets to the Roman Pantheon. The Pantheon opens at 8:30 a.m. every day except Sunday, when it opens at 9:00 a.m. It is currently free to enter but rumor has it that there might be a small entrance fee in the not-so-distant future. There’s sometimes be a line to enter, but since you are starting your day at the Pantheon, it shouldn’t be a long one. The Pantheon is the best-preserved building from ancient Rome and is still a functioning church. Visitors can take pictures inside the dome but there is an expectation that all visitors be respectful and quiet when exploring the space. Be sure to look for Italian painter and architect Raphael’s tomb—he’s probably the most well-known individual who is buried in the Pantheon. Next, take another easy stroll from the Pantheon to the Trevi Fountain. This baroque-fountain is the largest in the city and one of the most iconic in the world. It recently underwent a complete reconstruction thanks to Rome-based fashion retailer Fendi, who paid for its restoration. The fountain can be visited day or night, and while this itinerary has you visiting it during the day, it’s also worthwhile to see it at night if you have time to return. P.S. : It works! I tossed a coin into the Trevi Fountain when I studied abroad there and have been back to Rome two times since! From the Trevi Fountain, it’s a quick 10-minute walk to the Spanish Steps. Be sure to grab a slice of pizza or a panini from one of the restaurants you walk past if you get hungry because chances are they will be closed for their afternoon siesta later in the day! Another example of baroque architecture, the Spanish Steps connect Piazza di Spagna with the upper piazza Trinita dei Monti. While the Spanish Steps can be very crowded, visitors can escape the crowds by visiting the Trinita dei Monti church at the top of the steps or by getting a glass of wine at the Il Palazzetto Cocktail & Wine Bar that overlooks the Piazza di Spagna. The Spanish Steps are the last stop on the free, self-guided walking tour, and our next stop on the itinerary will require using the metro or taking an Uber/taxi to Basilica San Clemente. For the metro, take the MEA line towards Anagnina from the Spagna metro station located at the Spanish Steps and get off at the Manzoni stop, then it’s a quick 10-minute walk to Basilica San Clemente. If you want to avoid the metro, it will cost about 12€ to take an Uber/taxi from the Spanish Steps to Basilica San Clemente. This church is actually three churches built one above the other, so visitors are able to see the ruins of the two different levels of churches below the present basilica. It is 10€ to tour the lower levels, which are open to visitors 9:00 a.m. – 12:30 p.m. and 3:00 p.m. – 6:00 p.m. every day except Sunday, when hours are 12:00 p.m. – 6:00 p.m.
After spending a couple hours at Basilica San Clemente, enjoy some dinner and gelato at a place of your choosing (you really can’t go wrong with either at any eatery in Rome), and we’ll see you tomorrow for an early morning start to tour the Vatican! *Looking for more Italy guidance? Check out this guide for a 3-week Italy itinerary. Get ready for the 2nd day in your 3 day Rome itinerary. The Vatican Museum is open Monday – Saturday 9:00 a.m. to 6:00 p.m. and the entrance ticket also works to get into St. Peter’s Basilica on the same day. The queue for the Vatican Museum is one of the longest visitors will experience in all of Europe, so I highly recommended that you purchase your tickets online in advance and pay the 4€ online booking fee which grants you “skip the line” access. The other option is to arrive early to get in line (like by 7:30 a.m. at the latest!). For 11€ more, you can get the audio guide for the Vatican Museum, which I also recommend; it’s full of helpful information and it’s great to know what you are looking at while exploring the massive museum. At the end of the museum tour, you will have access to the iconic Sistine Chapel, and after departing the museum, you can go next door to St. Peter’s Basilica—but be warned: the security access line into the Basilica is also very long. Fortunately, if you start your day early enough at the Vatican, you should get to St. Peter’s Basilica at a time when the line shouldn’t be too bad. Visiting the Vatican and St. Peter’s Basilica will take the better part of the day. From the Vatican, you will head to the neighborhood of Trastevere, which is about a 2 km walk from the Sistine Chapel. Pro tip: take a quick detour to Castel Sant’Angelo to get a picture in front of the circular, 2nd century castle! This neighborhood is considered a “best-kept secret” for being a great place to experience authentic Italian culture without crowds of tourists. There are amazing restaurants, cafes, bars, and gelaterias in Trastevere, as well as also several picturesque piazzas to explore, including the large Piazza di Santa Maria. 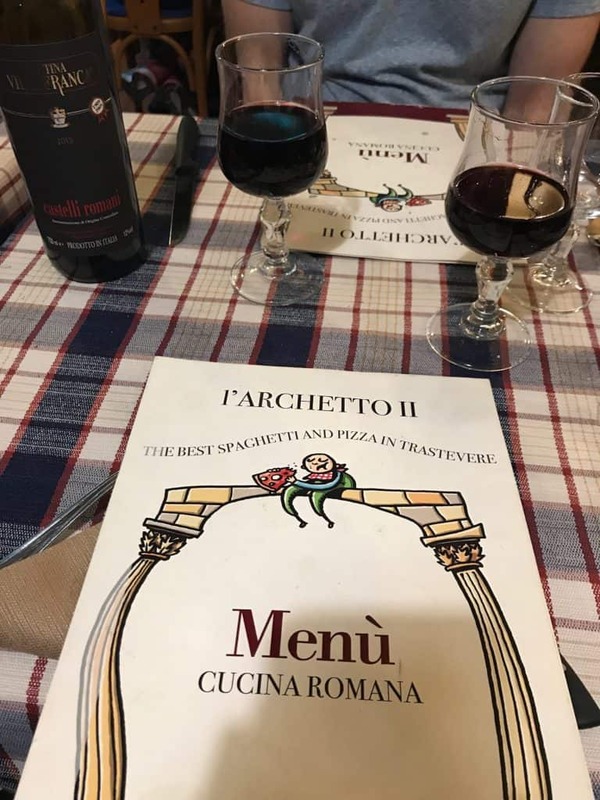 While exploring Trastevere, plan to enjoy dinner and a bottle of house wine at local favorite Ristorante L’Archetto II, located just a few blocks from Piazza di Santa Maria. The final of your 3 days in Rome will start off at one of the most iconic locations in the city. The Colosseum opens daily at 8:30 a.m.—be sure to get there as close to opening time to avoid the lines and the crowds. I recommend that you purchase your entrance tickets online in advance to avoid the line to purchase tickets. Coop Culture’s website is the official ticket site for the Colosseum. Your ticket will also gain you access to the nearby Roman Forum and Palatine Hill. To get the most out of your Colosseum experience, consider splurging (it’s only about 5€ more) for one of the group tours or audio/video tours that is offered on the Coop Culture website. Another option, for those looking for a completely guided tour experience, is to participate in a group tour of all three locations through a tour agency, who will handle procuring your entrance tickets along with giving you a full guided tour of both the Roman Forum and Palatine Hill in addition to the Colosseum. 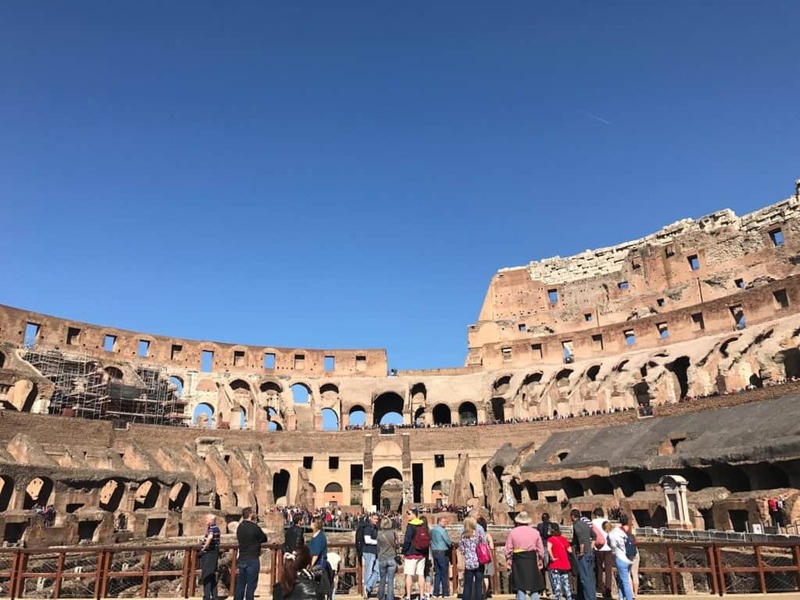 My husband and I did this type of tour on our most recent trip to Rome and we really liked how the tour guided us through all three locations while explaining its fascinating history. After touring the Colosseum, Roman Forum, and Palatine Hill, it will be lunchtime and you’ll be needing some fuel. Visit Campo de’ Fiori for an authentic Italian market experience. To get there, you can either walk 2.5 km or take the 87 bus from the Colosseo stop, located outside the Colosseum, to the Rinascimento stop, which drops you off within a few blocks of the Campo de’ Fiori. This square hosts a large daily market until about 2:00 p.m. where you can shop for souvenirs, fresh fruit or produce, or even pick out fresh flowers. There are several options for lunch (think pizza or paninis!) located in and around the Campo de’ Fiori. These Roman ruins are located right next to the Campo de’ Fiori and stand in the same location where Julius Caesar was stabbed. Visitors here may notice a large population of cats amongst the ruins; Lago Argentina is now a cat sanctuary and shelter. Volunteers feed, clean, and care for the cats daily, and visitors can go inside the Torre Argentina Cat Sanctuary to adopt (or adopt from a distance!) the cats. Since I am a cat person, I make it a priority to go inside the cat sanctuary whenever I am in Rome to see the kitties and the inspiring volunteers who care for them. Even though you visited the Trevi Fountain during daylight on Day 1, it’s worth revisiting at night to see the fountain lit up. While enjoying some gelato—that’s a given. Italy is known for its wine, and there are several evening guided wine tastings and tours in Central Rome for visitors looking to experience local wine. Check out the various options offered through Viator or Get Your Guide and filter based on date, duration, and cost to find the perfect wine tasting experience for you! Football, or soccer as we refer to it in the U.S., is one of the most popular sports in Europe, and Italy is no exception. Rome is home to two professional soccer clubs, AS Roma and SS Lazio, who play in Serie A, Italy’s top division. Both teams share the Stadio Olympico and alternate weekends in which they play in the stadium. If you are visiting Rome anytime during August to May, chances are you will be able to catch one of the teams playing during your stay! Congratulations — you made it! You were able to experience Rome by following this three-day Rome itinerary! Now get some sleep and safe travels to wherever your next adventure takes you. Share photos of your Rome magic with me on Instagram at @OneSavvyWanderer and feel free to leave any itinerary questions in the comments! 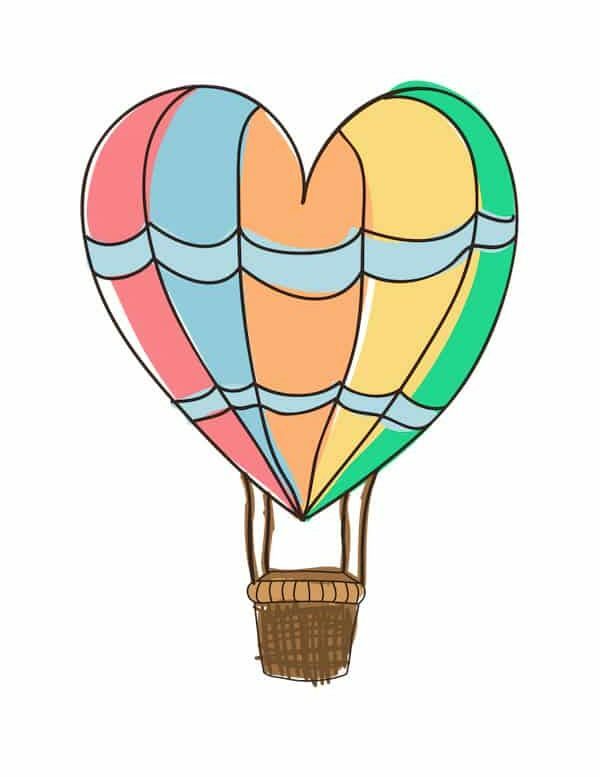 About the Author: Andrea is a wife, mom, and full-time HR professional who somehow finds time to travel the world (economically, as insisted by her accountant husband!) and share her wisdom and hard-earned tips on her travel blog, One Savvy Wanderer. Follow her on Facebook to find out more on how to get the smallest bill while traveling the world.